Using Advanced Accounting's editable W-2 feature pertaining to boxes 10, 12, 13 or 14 first introduced in version 6 in 2007, the costs related to employer-sponsored health coverage can be easily input so that W-2 forms will contain this information as may be required. While the requirement for this information went into effect in 2012, the IRS has provided transition relief for many businesses until "final guidance" is provided that still appears to be pending. The current recommended course of action can be found here. IRS 2015 W2/W3 general instructions on the one hand indicate that reporting of these amounts is required, but then makes a somewhat circular reference to the Box 12 instructions which then refers one back to the recommended reporting guidelines and the reference to future guidance. For those companies who either want to, or are required to, report the amounts, they are reported using code DD in Box 12 (a, b, c, or d). The amounts reported are not taxable to the recipient and are simply an information requirement (logically then Box 14 would have represented a more appropriate place for them, but that is not where they are reported). Unlike deferred compensation amounts included in Box 12 and carried over to box 12a on the W-3 form, code DD amounts are not reported on the W-3 transmittal form. Previously anything entered in one of the four slots in Box 12 via Advanced Accounting's W-2 option were summed and included in the W-3 Box 12a total. Starting in 2015, we have added programming logic to exclude any DD code amounts from being included in that total. 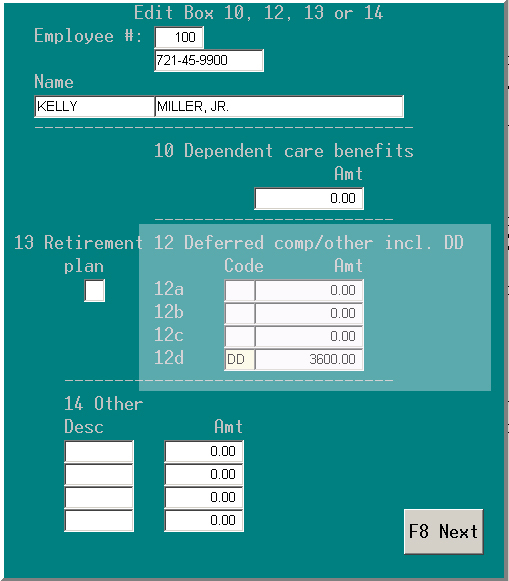 Other than this change (and adding some additional instructional language on the main screen of Advanced Accounting's PR-G option used to print W-2s as well as when presented with the "edit" question along with some screen changes to reference code DD on the pertinent input screen), the program remains the same. While we still support all versions of Advanced Accounting ever released, only the latest version (7i with latest updates, and soon version 8) will contain the changes described above. So what are the steps for reporting this information? The highlighted Box 12 section is where you input the code DD and then to the right of that code, the cost amount for that employee. It does not matter in which of the a,b,c, or d slots that you input the code and amount. Further, you can input it in different places for different employees if you need to. (For simplicity however we would recommend using Box 12d for all DD amounts; or chose some other box that is the same for all; but again, this is not required.) The program will include all amounts entered in Boxes 12 a,b,c, and d into the W-2 transmittal's Box 12a except it will now exclude any DD coded amounts. (5) Simply continue to the next employee and process to completion as normal.